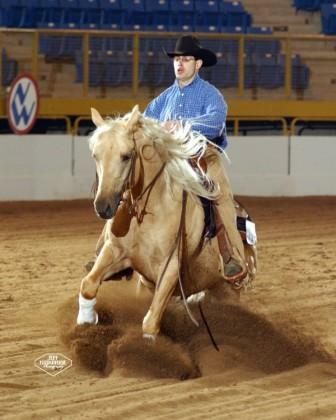 Sooty Buckskin/Star/Both Hind Coronets AQHA Show H-0/P-11.5 ROM Reining Superior Reining NRHA COM-Bronze 1990 NRHA Limited Open-Top 10 Multiple ROMs, Multiple Honor Rolls- Halter, WP, Hunter Hack, Disciplined Rail, Reining, W Riding; Res Honor Roll W Riding, W trail, Barrel Racing, Pole Bending, Disc Rail- Hunt Seat, Performance Horse Sire of IBHA World Champions in Reining, Working Cowhorse, Barrel Racing, pole bending. 88% NFQHA 100% FQHA http://www.fqha.com/articles/100percentfoundationstallions.htm P-80 NRHA World Champion 4 & 1975 Non-Pro) Top Ten World Show (1974 Reining Superior Performance (1974 Reining NRHA $6,090 ROM Performance NRHA HALL OF FAME NRHA $1 million sire #1 All Age/All Division Leading NRHA Paternal and Maternal Grandsire Breeder: John & Mary Bowling, Sumner, Ia. Dam of NRHA Money earners,NCHA Money earners, Multiple Rom and Honor Rolls, IBHA Halter point earners, IBHA perf point earners, 1990 NRHA Top 10 Limited Open, IBHA Superior Reining.